A team of six astronomers reports that when they examine the light (more specifically, the X-rays) coming from clusters of galaxies around the sky, and account for all the X-ray emission lines [light emitted in extremely narrow bands by atoms or their nuclei] they know about, there’s an excess of photons [particles of light] with energy E=(3.55-3.57)+/-0.03 keV, a “weak unidentified emission line”, that can’t easily be explained. What could it be? Well first: is this emission line really there? The astronomers claim to detect it in several ways, but “the detection is at the limit of the current instrument capabilities and subject to significant modeling uncertainties” — in other words, it requires some squinting — so they are cautious in their statements. Second: if it’s really there, what’s it due to? Well, the most exciting and least likely possibility is that it’s from dark matter particles decaying to a photon with the above-mentioned energy plus a second, unobserved, particle — perhaps a neutrino, perhaps something else. I’ll let Resonaances explain the sterile neutrino hypothesis, in which the dark matter particles are kind of like neutrinos — they’re fermions, like neutrinos, and they are connected to neutrinos in some way, though they aren’t as directly affected by the weak nuclear force. But before you get excited, note that the authors state: “However, based on the cluster masses and distances, the line in Perseus is much brighter than expected in this model, significantly deviating from other subsamples.” In other words: don’t get excited, because something very funny is going on in the Perseus cluster, and until that’s understood, the data can’t be said to be particularly consistent with a dark matter hypothesis. One more anomaly — one more hint of dark matter — to put on the pile of weak and largely unrelated hints that we’ve already got! I don’t suggest losing sleep over it… at least not until it’s confirmed by other groups and the Perseus cluster’s odd emissions are explained. Some readers may remember that back in May, as I discussed in some detail, the IceCube experiment reported a new and exciting observation — possibly the first discovery of high-energy astrophysical neutrinos: neutrinos, with energies 5 – 50 times higher than those of the protons at the Large Hadron Collider, created in outer space and arriving on earth. This is to be contrasted with most neutrinos measured at IceCube and other previous similar experiments, which have lower energy and are created in the earth’s atmosphere by other types of particles hitting atoms in the air (see Figure 4 of this article.) Specifically, where the IceCube folks expected to measure 10 candidate events from non-neutrino backgrounds, they instead measured 28. Well, these results were reported at a conference in May, but only now is the paper appearing in published form, in the journal Science. Here’s the IceCube press release about the publication of their paper, http://icecube.wisc.edu/news/view/171 . All indications are that there are few changes since May, except for greater confidence in the result; the numbers quoted all match the ones that I wrote about back in the spring. If there is anything strikingly different from May, I haven’t yet noticed it; please let me know if you’re aware of something. For those of you who missed this back in May, I wrote a few relevant posts back then that you may find useful. Meanwhile, you may also remember that there was a big Gamma Ray Burst [GRB] observed in April — the most energetic ever measured. [We were hoping that IceCube would observe neutrinos from that GRB, but it did not.] Science is also publishing papers about that event, and how measurements of it are making people rethink their understanding of how GRBs occur. Once I’ve learned more about this, I’ll post something more detailed. Curiously, both of these stories are appearing in the press with big headlines, as though they are new news… but if they sound familiar, it’s because they are indeed six months old. In my last post, I promised you some comments on a couple of other news stories you may have seen. Promise kept! see below. Don’t confuse these two processes! (Top) The process B_s –> muon + anti-muon, covered in Wednesday’s post, agrees with Standard Model predictions. 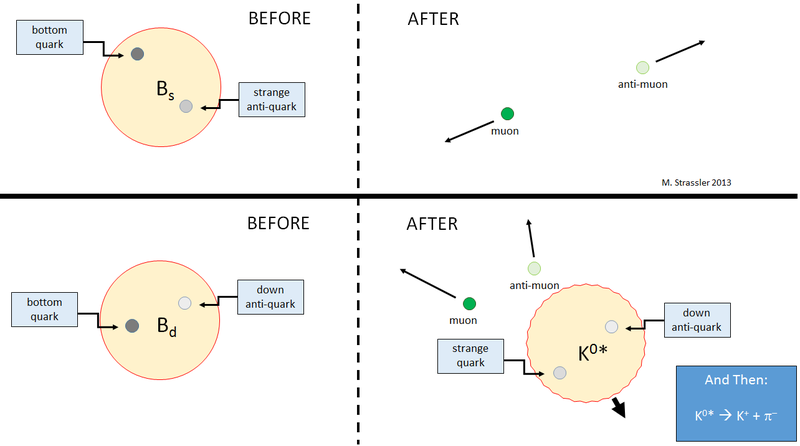 (Bottom) The process B_d –> muon + anti-muon + K* is claimed to deviate by nearly 3 standard deviations from the Standard Model, but (as far as I am aware) the prediction and associated claim has not yet been verified by multiple groups of people, nor has the measurement been repeated. A few theorists have even gone so far as to claim this discrepancy is clearly a new phenomenon — the end of the Standard Model’s hegemony — and have gotten some press people to write (very poorly and inaccurately) about their claim. Well, aside from the fact that every year we see several 3 standard deviation discrepancies turn out to be nothing, let’s remember to be cautious when a few scientists try to convince journalists before they’ve convinced their colleagues… (remember this example that went nowhere? …) And in this case we have them serving as judge and jury as well as press office: these same theorists did the calculation which disagrees with the data. So maybe the Standard Model is wrong, or maybe their calculation is wrong. In any case, you certainly musn’t believe the news article as currently written, because it has so many misleading statements and overstatements as to be completely beyond repair. [For one thing, it’s a case study in how to misuse the word “prove”.] I’ll try to get you the real story, but I have to study the data and the various Standard Model predictions more carefully first before I can do that with complete confidence. I’ve finished (more or less) a version of the promised article on IceCube — the giant neutrino experiment that may have made a major discovery, as announced last week, and that had an opportunity to make another a few weeks ago (though apparently nature didn’t provide). The article is admittedly a bit rushed (darn computer trouble) and therefore a bit rough, and it also leaves out some more subtle points that may become important in the future — but I think it’s complete enough to help explain how IceCube made their most recent measurements. As usual, please send comments and questions, and I’ll work on it further. Here’s the link to the article. You may also find it interesting to read more generally about how neutrinos are detected, and about the weird story of neutrino types, and how they can oscillate from one type to another as they travel. I was sent or came across a few interesting links that relate to things covered on this blog and/or of general scientific interest. It was announced yesterday that the European Physical Society 2013 High Energy Physics Prize was awarded to the collaboration of experimental physicists that operate the ATLAS and CMS experiments that discovered a type of Higgs particle, with special mention to Michel Della Negra, Peter Jenni, and Tejinder Virdee, for their pioneering role in the development of ATLAS and CMS. Jenni and Virdee are both at the LHCP conference in Barcelona, which I’m also attending, and it has been a great pleasure for all of us here to be able to congratulate them in person . One of the possible interpretations of the new class of high-energy neutrinos reported by IceCube (see yesterday’s post) is that they come from the slow decay of a small fraction of the universe’s dark matter particles, assuming those particles have a mass of a couple of million GeV/c². [That’s much heavier than the types of dark matter particles that most people are currently looking for, in searches that I discussed in a recent article.] I didn’t immediately mention this possibility (which is rather obvious to an expert) because I wanted a couple of days to think about it before generating a stampede or press articles. But, not surprisingly, people who were paying more attention to what IceCube has been up to had recently written a paper on this subject. [Here’s an older, related paper, but at much lower energy; maybe there are other similar papers that I don’t know about?] At the time these authors wrote this paper, only the two highest energy neutrinos — which have energies that, within the uncertainties of the measurements, might be equal (see Figure 2 of yesterday’s post) — were publicly known. In their paper, they predicted that (just as any expert would guess) in addition to a spike of neutrinos, all at about 1.1 million GeV, one would also find a population of lower-energy neutrinos, similar to those new neutrinos that IceCube has just announced. So yes, among many possibilities, it appears that it is possible that the new neutrinos are from decaying dark matter. If more data reveals that there really is a spike of neutrinos with energy around 1.1 million GeV, and the currently-observed gap between the million-GeV neutrinos and the lower-energy ones barely fills in at all, then this will be extremely strong evidence in favor of this idea… though it will be another few years before the evidence could become convincing. Conversely, if IceCube observes any neutrinos near but significantly above 1.1 million GeV, that would show there isn’t really a spike, disfavoring this particular version of the idea. In sad news, in the “all-good-things-must-come-to-an-end” category, the Kepler spacecraft, which has brought us an unprecedented slew of discoveries of planets orbiting other stars, may have reached the end of the line (see for example here), at least as far as its main goals. It’s been known for some time that its ability to orient itself precisely was in increasing peril, and it appears that it has now been lost. Though this has occurred earlier than hoped, Kepler survived longer than its core mission was scheduled to do, and its pioneering achievements, in convincing scientists that small rocky planets not unlike our own are very common, will remain in the history books forever. Simultaneous congratulations and condolences to the Kepler team, and good luck in getting as much as possible out of a more limited Kepler. IceCube [here’s my own description of the experiment], the big high-energy neutrino experiment cleverly embedded into the ice at the South Pole, announced a very interesting result yesterday, following on an already interesting result from a few weeks ago, one that I failed to cover properly. They have seen the highest-energy neutrinos ever observed, ones that, unlike previously observed high-energy neutrinos, appear not to be generated by cosmic rays hitting the top of the atmosphere. Instead, they apparently come from new sources far out in space. And as such, it tentatively appears that they’ve opened up, as long anticipated, a new era in neutrino astronomy, in which high-energy neutrinos will be used to understand astrophysical phenomena!